May 19-25, 2018 is National Safe Boating Week in the U.S.
A 12-foot boat that folds. A paddleboard in a backpack. A kayak that blows up like a balloon. With a Get Out on the Water: Everyone Can Enjoy Boating theme, New York Sea Grant is reminding those who enjoy inflatable watercraft, smaller boats, and nonmotorized paddlecraft to know and follow New York State boating laws. “As more and more people learn about the fabulous boating resources in New York State, it becomes increasingly more important to educate people of all ages about the best practices for safe, legal, and clean boating. New York Sea Grant is perfectly positioned to extend those practices to the public in both the Great Lakes and marine districts,” comments Katherine Bunting-Howarth, associate director of New York Sea Grant and assistant director of Cornell Cooperative Extension, Ithaca, NY. 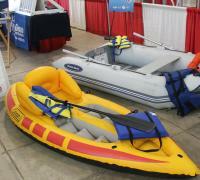 New York Sea Grant has equipped its Inflate-A-Fleet exhibit with the folding boat and craft that can be inflated with gear and signage noting all the required and recommended items for boaters to be legal, safe and environmentally-friendly on New York State waters. Those items include such items as life vests and reflective decals for paddles. New York Sea Grant has received New York State, National Association of Boating Law Administrators, and U.S. Coast Guard Auxiliary awards for the Discover Clean and Safe Boating campaign. The program has educated more than one million people, including deaf boaters, emergency services first responders, anglers, sailors, and paddle sports enthusiasts, since its inception in 2008. New York Sea Grant partners in the Discover Clean and Safe Boating campaign include the Boating Industries Association of Upstate NY, U.S. Coast Guard Auxiliary, New York State Marine Services Bureau, and marine industry businesses.